Forget about the mess, the clean up and the headaches of organizing a Birthday Party for your child at home. Book your child's Birthday Party at Burlington Bowl. You invite the guests, and we take care of the rest. Simply review the different packages below, then complete the online Information Request Form to the right or call 905-681-2727 to book your child's Birthday Party. In addition to the features listed, you can choose to add even more excitement with our Glow-in-the-Dark, Music, and Special Effect Lighting package. 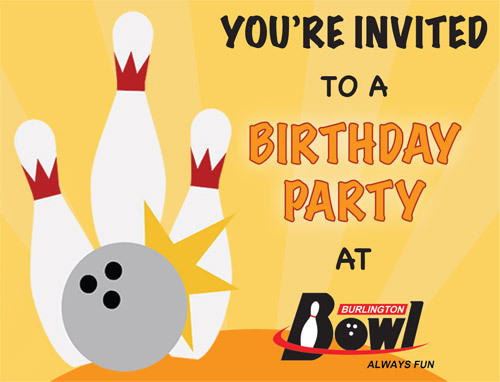 So book a fun-filled Birthday Party at Burlington Bowl where your bowling and entertainment experience is ALWAYS FUN!